Dr. Joan Girona of the Institute of Agroalimentary Research and Technology in Catalonia, Spain, is studying irrigation and the water and nutrient needs of fruit trees. He needed to capture pyranometer readings throughout his orchard. Dr. Girona mounted Apogee pyranometer sensors and Campbell Scientific dataloggers on a carefully laid out model train track around the orchard. 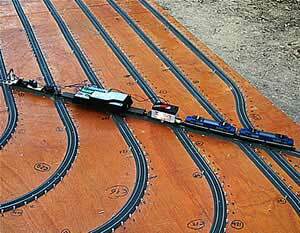 The train carrying the pyranometer sensors and dataloggers wound around the track and could take measurements at specified intervals. Dr. Girona could then take thousands of measurements. His system was so effective he plans to continue running it for more experiments in the future. Learn more about Dr. Girona’s experiment by reading the original article on Campbell Scientifics’ website.